Pediatric regional anesthesia is becoming more commonplace in anesthetic practice, improving the postoperative experience of both children and their parents/caregivers. Its use is expected to continue to grow in popularity. However, real-time ultrasound guidance for regional anesthesia is not without some degree of risk. As this paradigm shift gains traction, so too does the need grow for properly trained anesthesiologists, clinicians, and technicians. Simulation-based healthcare training in anesthesia may suggest part of the solution. Through experiential learning, trainees can acquire skills used in the management of events rarely encountered in practice, such as local anesthetic-induced cardiac toxicity. Once basic ultrasound insertion skills have been acquired and solidly developed (phantoms may assist with this), these learnings can be transferred to a real-life clinical setting for better patient care and better outcomes. Teach, practice and learn central and regional line placement procedures for pediatric patients within a highly-realistic, yet risk-free environment withCAE Blue Phantom Pediatric Regional Anesthesia and Central Line Ultrasound Training Model. 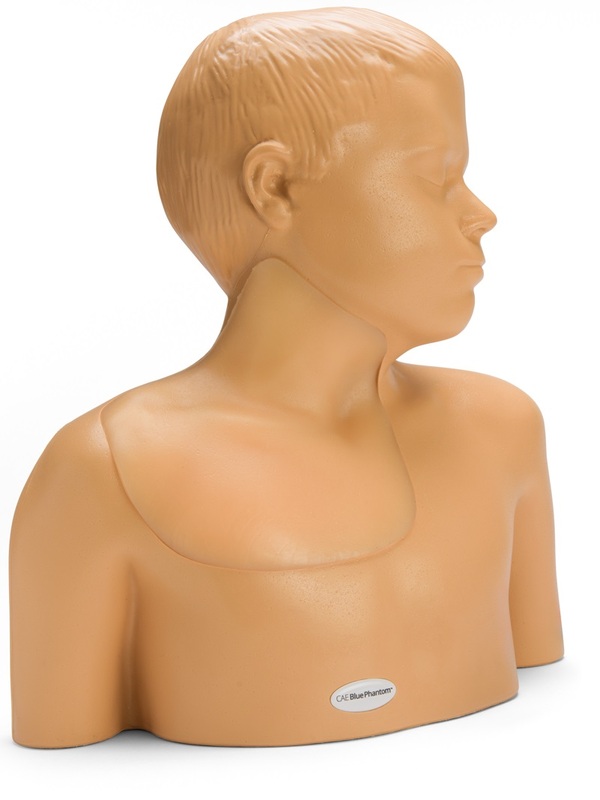 This ultra-durable and high-quality training model comes complete with an upper torso mannequin which incorporates all the anatomy required to gain proficiency in the insertion and management of ultrasound for pediatric central lines and peripheral nerve blocks on a simulated 6-year old patient. Blue Phantom's pediatric regional anesthesia and central line placement model is excellent for both ultrasound-guided and blind insertion skills development, with quality imaging characteristics to optimize training and self-healing tissue that matches the acoustic properties of real human tissue. With Blue Phantom, learners get the advanced tools they need to gain experience and confidence in insertion procedures before ever performing the procedure on a live patient. Get detailed information at BluePhantom.com.